Water Dog Reservoir is located east of Jumbo Reservoir, just off Highway 65, in the Mesa Lakes Ski Area. This is a relatively short trail but the elevation change is enough to make for a good workout. Most of the trail follows various forest and reservoir service roads and is well marked with the traditional blue diamonds. There are areas where white out conditions could make route finding next to impossible. If such conditions are likely to occur you should consider carrying a good GPS with extra batteries and a pack stocked with winter survival items. I have heard of at least one person who died under such conditions in this area. In good weather with normal visibility it is hard to imagine how anyone could wander of the wide and well marked trails but when a white out occurs everything gets obscured and indistinguishable. There are several Nordic trails in the Mesa Lakes Ski Area. The most popular are West Bench, Griffith Lake and Water Dog Reservoir. I always enjoy snowshoeing and skiing on the roads around Mesa Lakes also. Jumbo Reservoir is the best place to park for West Bench and Water Dog. There are two pullouts further up along Highway 65 that serve as trailheads to the Griffith Lake area. If you are interested in a longer outing you can park at Jumbo Reservoir and make your way up and around Water Dog to Griffith Lake and then keep going past Lake of the Woods to the Cottonwood trail and then return on Forest Service Rd. 254.1A. You can cut that a little shorter by taking the Forest Service Rd. 506.1A that cuts over to Bull Creek Reservoir No. 4. There is a little trail etiquette that helps to keep things friendly between showshoers and skiers, on ungroomed trails, which is basically 'keep off each others tracks'. It seems like a one-sided affair to me because the skiers always seem to use an existing snowshoe trail if there isn't already a set of ski tracks. The nicest approach if you are snowshoeing is to avoid walking on the ski tracks and cut your own path. If you are on a single track trail, or close to the trailhead, then it becomes a lot more difficult to respect each others tracks. Hopefully, everyone can be polite and share the trails the best they can. My snowshoes are a pair of 38 inch Tubbs and they were only sinking into the fresh snow a couple of inches. The snow was over 3 feet deep on the level though. The begins at Jumbo Reservoir across Highway 65 and follows Forest Service Rd. 254 as it heads east. 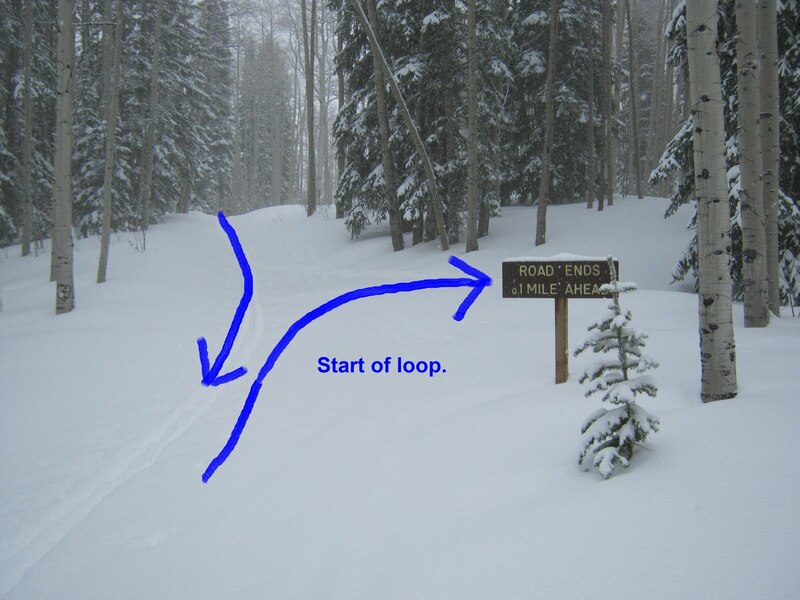 The loop begins about a third of a mile from the trailhead. The trail follows a reservoir service road towards Water Dog Reservoir. There is a sign that indicates that the road ends in less than one mile. It is only about a half mile from the trailhead to Water Dog. Most of the traffic from here continues around the south side of the reservoir towards Griffith Lake. For this outing I continued to the left and crossed the dam. Just past the dam the trail narrows and heads uphill. The blue diamond markers seemed a little further apart for this route but occurred often enough to be reassuring. The map on my GPS showed the Forest Service roads so even though I was cutting a fresh trail through here I could tell right where I was going. I rejoined the Forest Service Rd. 254 after 1.2 miles and at 2.1 miles I was back at the beginning of the loop. The clouds rolled in and the visibility dropped considerably. It wasn't too bad when there were trees close by but when the trail crossed through clearings it was like being blind. The nice thing about carrying a GPS is that you can zoom out and see where you are compared to where you began. Snowshoeing at 10,000 feet in fresh snow is a lot harder than hiking on the clear trails in the valley. The ungroomed trails in the Mesa Lake area also take a lot more effort than the nice groomed trails on top of the mesa. If you prefer a little more solitude the crowds are much smaller on the ungroomed trails. On this outing I only saw one other person even though there were probably 6-10 people in the area. It's hard to find a good detailed map of the Nordic trails in the Mesa Lakes area. I carry a Forest Service map that I bought at the Grand Mesa Visitor Center that shows most of the lakes, trails and roads. If you would like to check out Water Dog Reservoir for yourself then all you have to do is 'Take a hike'.